U.S. Sen. Lamar Alexander, R-Tenn., visits the Chattanooga Times Free Press on March 20, 2016, for a conversation with the newspaper's editorial board. 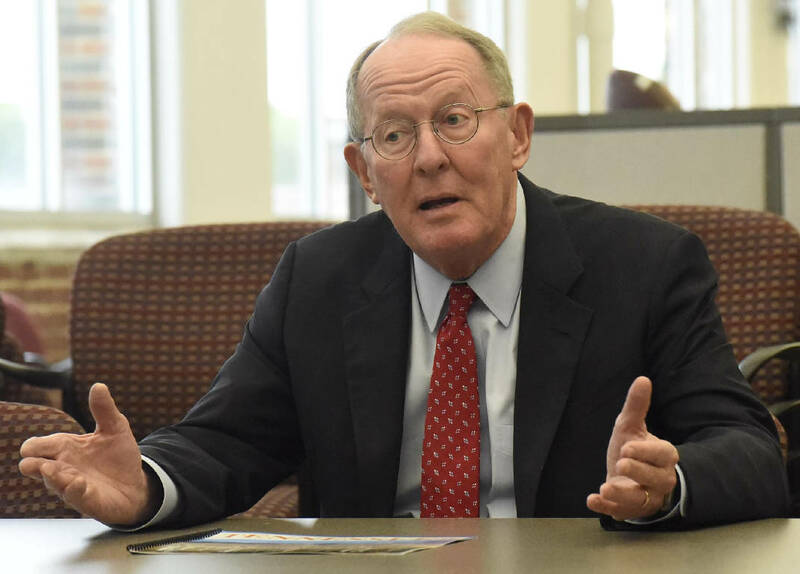 NASHVILLE — U.S. Sen. Lamar Alexander, R-Tenn., urged President Donald Trump on Tuesday to drop plans to eliminate government insurance subsidies that help millions afford health coverage in order to give Congress time to "stabilize and strengthen the individual health insurance market." Alexander, chairman of the Senate Health Committee, announced plans he and the panel's senior Democrat, Sen. Patty Murray of Washington, will hold bipartisan hearings beginning Sept. 4. The goal is coming up with a short-term solution so that "Americans will be able to buy insurance at affordable prices in 2018," Tennessee's senior senator said in comments to his committee. "There are a number of issues with the American health care system, but if your house is on fire, you want to put out the fire, and the fire in this case is the individual health insurance market," Alexander added. "Both Republicans and Democrats agree on this." Angry over the Republican-run Senate's inability last week to repeal and replace the 2010 Affordable Care Act, Trump has threatened in tweets to cut an estimated $7 billion worth of "cost-sharing reduction" payments. The money is paid to health insurers to make coverage more affordable for low-income individuals and families. "Without payment of these cost-sharing reductions, Americans will be hurt," Alexander said. Murray, who just last month blasted Alexander and Republicans for seeking to push an Affordable Care Act repeal bill through the Senate with no public hearings, welcomed efforts to work together to develop a bipartisan fix. "With Trumpcare rejected in the Senate, I'm glad to get to work on health care w/ @SenAlexander," she tweeted. "We've tackled tough issues together before!" In his remarks to the committee, Alexander said if Trump over the next two months and Congress over the coming year take steps to provide "certainty" over the cost-sharing subsidies "that should allow insurance companies to lower the premiums that they have projected." Because most insurers have priced their 2018 rates at two different levels — one with and the other without the federal cost-sharing — Alexander said "it's important not only that the president approve temporary cost-sharing for August and September, but that we in a bipartisan way find a way to approve it at least for one year so we can keep premiums down." That's only the first step "in what we may want to do about health insurance and the larger question of health care costs," Alexander said. "So we will proceed step-by-step." Another step, Alexander said, would "be to try to find a way to create a long-term more robust individual insurance market, but for the short-term, our proposal is that by mid-September we will see if we can agree on a way to stabilize the individual insurance market to keep premiums down and make affordable insurance available to all Americans."